WOW is the type of show that belongs in Vegas. Acrobatics, 3D-multi-media projections, great theatrical lighting and a really cool water stage. It's so...Vegas! Save up to $79 off tickets to see WOW at the Rio. Save the most when you book online to see WOW at the Rio Las Vegas. Get up to $40 off per ticket today! Be sure to compare all our promotions to get the best rates. A family-friendly show in Vegas that will captivate children and adults alike as the pool-stage erupts with acrobatics and choreography amidst multimedia projections. A cast of more than 30 international performance artists takes to the stage and pool to dance, fly, and flip with walls of water, holograms, and multi-media projections. 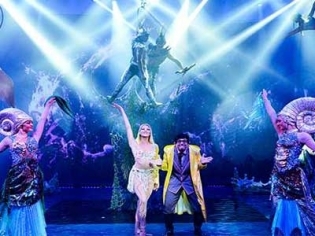 This entertainment spectacular is filled with acrobatics, choreography, magnificent music, theatrical lighting and water effects that will Wow you! This touring production finds a home for the first time in Las Vegas after already wowing 2.5 million people worldwide. The Rio Showroom has been customized with a new stage and a pool which invite audience interaction in the World of Wonder. This is a great show for families as the kids will be awestruck by the antics which defy the imagination.